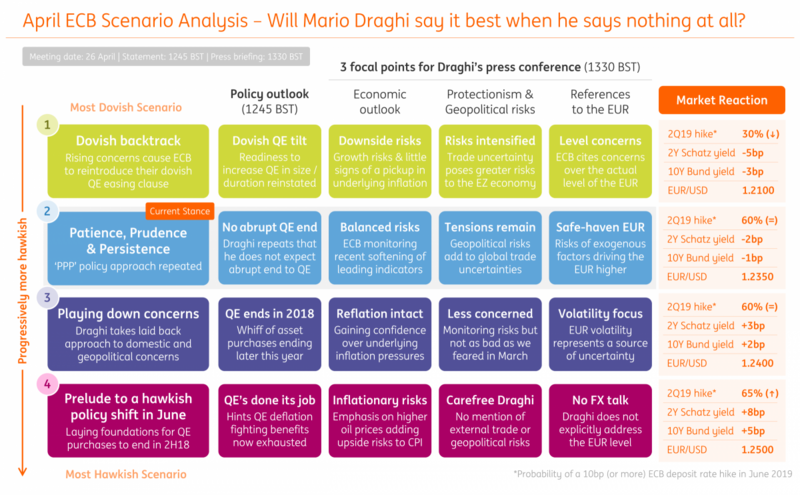 ECB Meeting Crib Sheet: Will Draghi say it best when he says nothing at all? After a relatively dovish message in March, the risk to the Euro at Thursday's ECB meeting is that President Draghi ratchets up his concerns over the outlook for the Eurozone economy - stemming from either slower cyclical macro dynamics and/or heightened trade and geopolitical uncertainties. In this dovish scenario, we could see EUR bulls retreat en masse as odds for a 2Q19 ECB depo rate hike are slashed further (EUR/USD here could fall back to 1.2100). In the absence of this, we think risk-reward favours modest EUR upside going into the meeting. A reiteration of the status quo constructive domestic economic outlook - with growth and inflation expected to broadly recover over the ECB's forecast horizon - could keep lingering EUR bulls excited over the prospects of a mid-2019 rate hike (current implied probability at 60%). Currency investors go into the ECB meeting less bullish on the EUR. Apart from the positioning of asset managers/institutional investors - which at record net long EUR positioning seems to suggest that this group of investors is playing the 'long game' - the recent lacklustre Eurozone data and relatively cautious policy comments by ECB officials have taken some of the steam out the EUR's cyclical upswing. 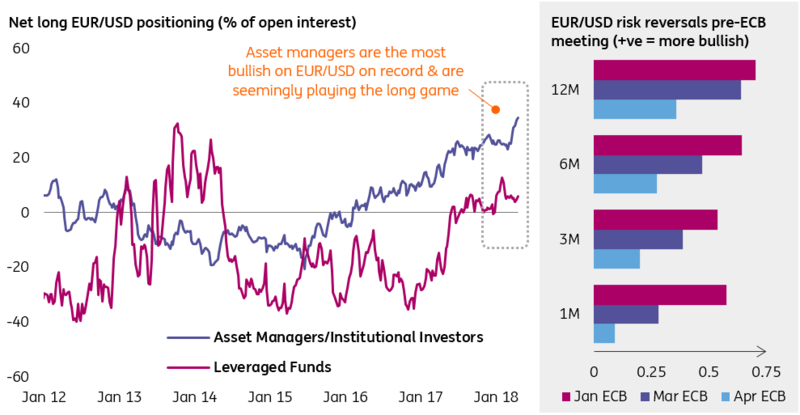 Positioning of leveraged funds has turned more neutral, while option markets - as indicated by EUR/USD risk-reversals - also point to less bullish optimism compared to before the March ECB meeting (see Graphic 4 below). We think President Draghi will find it extremely difficult to talk down the EUR this month. 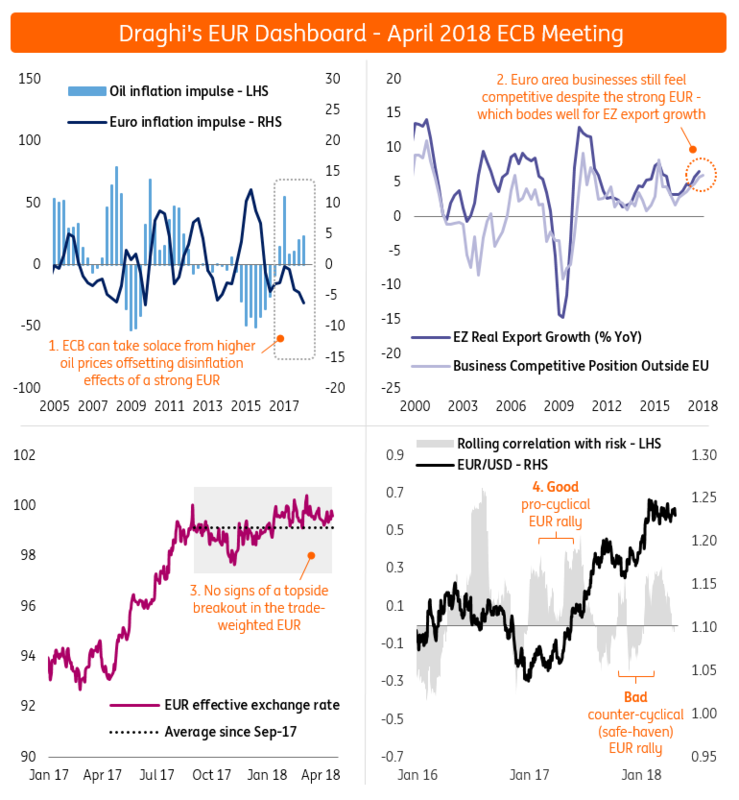 As our dashboard below shows (Graphic 2), there is very little macro or market evidence the ECB chief can point to when it comes to talking down the EUR. On the macro side, higher oil prices provide a buffer to any disinflationary effects stemming from a stronger currency, while similarly Eurozone businesses still feel competitive due to the strength of the global economy. The trade-weighted EUR has also remained stable year-to-date - suggesting limited evidence of broad-based EUR strength that could be of concern for ECB officials. On the market side, there's little evidence to suggest that the EUR is trading at an elevated level due to 'exogenous' (non-fundamental) factors; EUR/USD's sensitivity to changes in global risk sentiment remains neutral - indicating the single currency is not trading with any particular 'safe-haven' bias despite the recent uptick in global risk aversion. In fact, the currency is probably a secondary concern for the Governing Council this month given the elevated stock market volatility - which at this stage poses a greater risk to (more tighter) Eurozone financial conditions. A hawkish surprise would be if President Draghi begins to lay the foundations for a 2018 end to QE. This could come in the form of the Governing Council entertaining the prospect of an abrupt end to asset purchases in September - when the current tapered QE schedule is due to end. 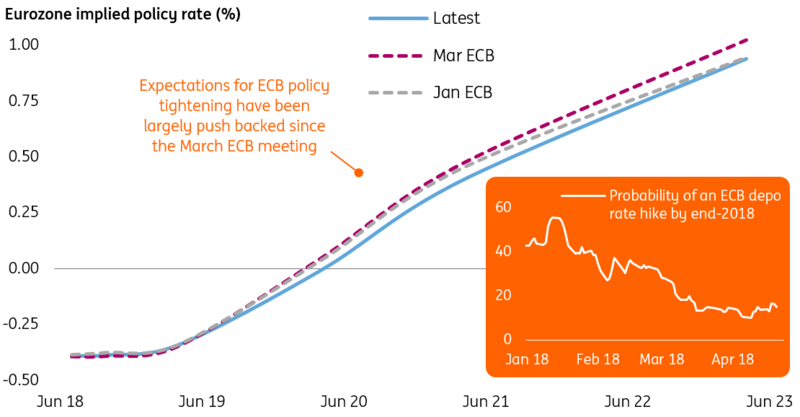 Judging by recent media reports, however, policymakers are unlikely to signal any significant QE policy announcements until the July ECB meeting, at the earliest. The bottom line is that it will be difficult to see a dovish Draghi-led decline in the EUR given the relatively low expectations going into the ECB meeting. The ECB chief would have to be on fine 'dovish' form to knock further steam out of the EUR's medium-term bullish trajectory. For now, we retain our EUR/USD target of 1.27-1.28 this summer on the back of a hawkish ECB policy re-assessment - which should set the pair on a path towards 1.30 by year-end.